Who doesn’t love a quick game of solitaire on the commute home, or a game of poker against your friends? These games have been part of our culture for hundreds of years, but gone are the days when we have to buy a pack of cards to play them; oh no, now all you need to do is sign into Facebook! Whatever your favorite style of card game is, the app store literally has something for everyone, from novice games all the way through to high stake poker tournaments. Here are 5 of the best loved and most played card games on Facebook available today! Battle Solitaire is one of the most popular solitaire games available mainly due to it being a clear mix of game play and social fun! Battle against your friends, or other users, to get rid of all your card deck before your opponent does. This is certainly a face paced game, so if you have never played solitaire before you may want to try a single player app. It is the pace of this game though that keeps players coming back for more; if you love an adrenaline fuelled game then this is for you! This is the perfect app for all you poker fans! This is a live play poker match that currently boasts to having over 60 million hands won daily – the odds must be fairly good for everyone to have a win at some point! This is very much the app for dedicated Poker fans and due to the amount of players per month, reportedly around 5 million, Zynga the game maker have now added in a real money version currently available in the UK. The best part of this Poker game is that the more you play the more chips you can collect! Texas Holdem Poker currently has over 35 million players per year. Cartel Poker is a classic poker game similar to the more well-known Titan online poker. It will take you back to the mafia years, where you will get the chance to build your own Gangster world and ultimately partake in some poker tournaments. Not only is this a fun game that is packed with atmospheric design and characters, this is also a visual feast with HD quality graphics. There is also the option with this poker game to become VIP members where you can gain access to extra chips, daily multiple jackpots and a member’s social area! When you sign up you will also be given 500 chips to start off with! Cartel Poker currently has over 50,000 players per month. 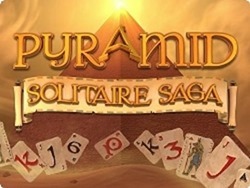 Pyramid Solitaire Saga is a mixture of traditional solitaire and an adventure strategy game, so it is perfect for those of us who love a multi level game with opportunities to progress further within the game and with your friends. The game play will take you back to ancient Egypt where you will start your solitaire match, the more cards you get rid of, the higher up the levels of the pyramid you will climb. On top of this you will also be able to collect booster points and other treasures that will help you on the later levels. This game is fun and will definitely have you hooked from the first match! Rummy may not be a card game that you will have thought of, or even heard of before, but this game is one of the fastest growing on Facebook today. Rummy is very similar to poker in many ways, and this is an excellent choice for any lover of games with high stakes and heart pumping finales. This is also another app that is meant to help you meet likeminded people in a fun environment! Tongits is well known as the card game of the Philippines, due to its huge fan base there and we can see why: the game is not purely about mindless fun as it relies on strategy and decisive action from all players. Author Bio: Jennifer Cole is a technology writer with over 5 years experience within the industry. When not writing she enjoys learning about the latest gadgets and playing games.